Every now and then, businesses have the unique opportunity to create a vehicle wrap that serves the community in a beneficial way. That was definitely the case in our creation of the Science Heads Inc. mobile observatory vehicle wrap. Science Heads Inc. is a non-profit organization founded by lovers of science who aim to share that passion with their surrounding community. Volunteers from Science Heads Inc. work with educators, parents, and students alike by visiting schools and community events within the Orange County area. They demonstrate how fascinating subjects in the Science, Technology Engineering, Art, and Math (STEAM) realm can truly be. Additionally, volunteers gather and create educational materials to foster a riveting education in these STEAM subjects. In 2008, Richard Stember began the Scopes-4-Schools organization to solicit telescope donations to public schools. The organization expanded to conducting educational astronomy events at these schools. Scopes-4-Schools saw so much success that they sought to expand their mission to include more fields to science. Of this Science Heads Inc. was created and serves its community, fostering education in the STEAM topics. 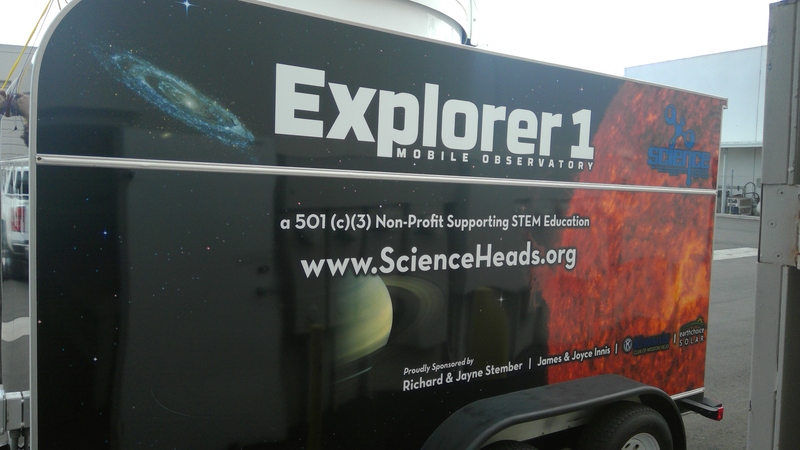 Science Heads Inc. and its dedicated team chose Full Sail Graphics & Marketing to brand their mobile observatory! This mobile observatory allows Science Heads Inc. to better spread their message across the community. The newly wrapped mobile observatory is making its public debut at Lake Forest Elementary School March 10th between 6pm and 8pm. Feel free to go check it out! With over 50 years of combined experience in graphics and marketing, the Full Sail Graphics & Marketing team is confident that we will deliver quality graphics on time and on budget. If you are looking for a vehicle wrap of your own, please feel free to give us a call at (714) 274-6706 or visit our website at //fullsailgraphics.com.